Summer is knocking on our door, and with it comes the heat and desire to taste something cold and refreshing. 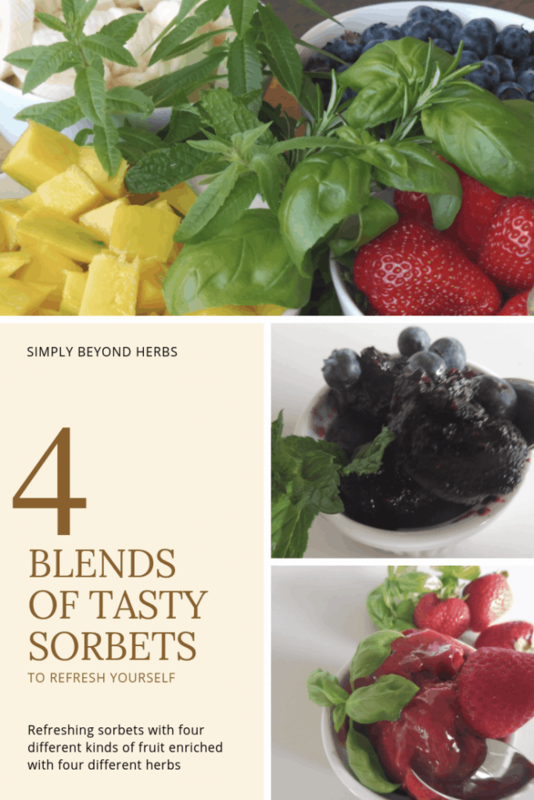 Because of the increasing number of fruits that need picking and pluskcing from our gardens, I have prepared sorbets with four different kinds of fruit enriched with four different herbs from my garden. Carefully selected combinations of fruits and herbs create refreshing blends that make sorbets with unique tastes that will appeal to every sweet tooth out there. Personally, I do not like sweetened sorbets so these can be either completely unsweetened (bananas and mango are already sweet) or you can gently blend the mixture with honey or elderberry cordial (I recomend this for strawberry and blueberry). The process is fast and simple, you just need to time everything well. Sorbets melt fast, especially in warm weather, so you either need to eat it immediately or place it in the freezer. add honey or elderberry cordial as per your taste or leave it unsweetened.